The Quartzlock E10-GPS Disciplined Rubidium represents a breakthrough in exceptionally low cost, traceable, calibration-free, off-air frequency & time standards. These very low cost rubidium oscilators maintain the high frequency & time accuracy required for demanding applications for the OEM manufacturer that provides the precision frequency and time synchronization required by base stations, optical network nodes, and high-speed digital networks. The compact A10-GPS OEM products offer Rubidium Atomic Standards which are disciplined to GPS, therefore providing extremely accurate and stable frequency and time. 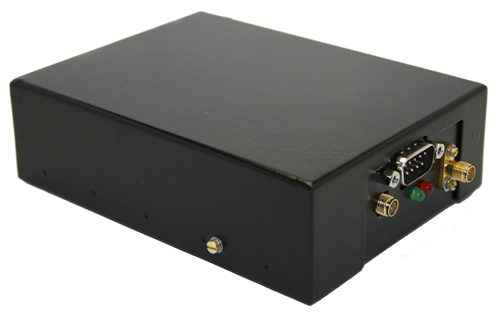 The A10-GPS model includes a Rubidium Standard, a GPS receiver, an external 1PPS input and a Rubidium-GPS disciplining circuit (Digital PLL). The Rubidium Oscillator is phase locked to the GPS or to the external 1PPS. All outputs are derived from the Rubidium Standard, which maintains the 10MHz and the 1PPS when GPS or external 1PPS inputs are interrupted. A GPS Disciplined Rubidium Clock frees the user from being continuously dependent on GPS reception, particularly in cases of either intentional or unintentional GPS interruptions. Also see our new GPS Disciplined Rubidium E80-GPS which can be configured with options such as, Distribution Card with 6 outputs, battery backup more than 2 hours of running on battery and Low Phase Noise options.